At the 2014 Frankfurt Motor Show, Mercedes brought with it the most awaited Mercedes Benz C63 AMG Coupe Edition 1 2017. Taking the sedan version a bit ahead the model is anticipated to steal the gleam while rolling over the streets. Powered by a powerful V8 engine, the model looks extremely luxurious and simultaneously maintains the fuel efficiency figures. 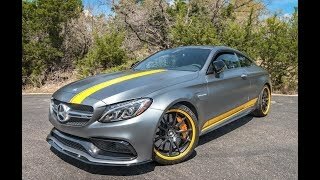 Let us have a look at the review of Mercedes Benz C63 AMG Coupe Edition 1 2017 to know more about it. 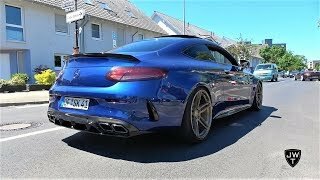 The interior of Mercedes Benz C63 AMG Coupe Edition 1 2017 is very much identical to that of the sedan version, however there few noticeable changes that will grab your attention. The model gets a bit sporty and is also adorned with high-quality materials and the metallic inserts. Use of fine quality wood and leather not only adds to the looks but also gives a smooth finish to the cabin. There’s a custom instrument cluster while the seats get more performance oriented giving you better command over the AMG badged steering wheel. The seating position gets lower stance providing utmost lateral support and come wrapped in Dinamica man-made leather and microfiber. 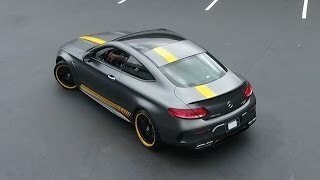 In all rounding up the interior details of Mercedes Benz C63 AMG Coupe Edition 1 2017 I would say, the entire set up accompanied by the carbon-fiber center stack and gorgeous dials, looks truly mesmerizing. The exterior of Mercedes Benz C63 AMG Coupe Edition 1 2017 takes the aggressive sedan to an elegant touch. Starting with the front fascia you’ll have a single bar grille alongside the A-shaped bumper. Along the fenders are elongated headlamps while the lower portion gets a massive air intake with fog lamps at each corner. Moving towards the rear fascia the bumper comes integrated with aerodynamic diffuser with four-exit exhaust systems while the trunk lid gets a small spoiler making the rear look sportier. 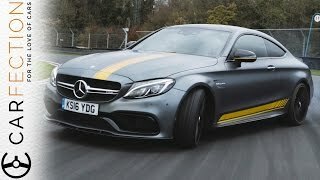 In all the wider and longer exterior of Mercedes Benz C63 AMG Coupe Edition 1 2017 has everything to complement its interior and the name that it carries. Beneath the hood of Mercedes Benz C63 AMG Coupe Edition 1 2017 is a biturbo V8 engine coming in two variants; AMG C63 and AMG C63 S. Both the engines deliver 476 hp and 510 hp of total output respectively while the peak torque comes to be 650 nm and 700 nm respectively. 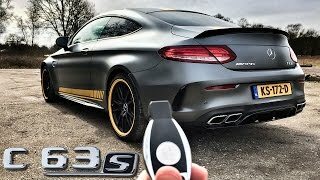 The top speed of Mercedes Benz C63 AMG Coupe Edition 1 2017 touches the mark of 155 mph while the 0-62 mph sprint can be knocked in 3.9 seconds and 3.8 seconds respectively.